It ain’t bad enough when you get behind some Jagoff that doesn’t have their windshield squirter-thingies properly aimed and, when they hit their squirt button, you get windshield washer fluid in your sunroof! But when it looks like a 10-foot couch is gonna be what comes at ya as your driving in speedy traffic, well, ya take notice. OR.. at least take a photo of the craziness and put it on this blog! This car passed me. I could see the couch, held on only with a bungee cord with the couch teetering back and forth over the trunk and hood using the roof and the conveniently place SINGLE bungee cord placed across the middle, as a very nicely placed fulcrum. (Mr. Gregga would be soooooo happy right now if he knew that I just used some of his geometry terminology from 10th grade). After I see the teetering couch sitch (short for situation), the car gets in front of me to go across the McKees Rocks Bridge. To make it even more dramatic, the back window of the car is plastic wrapping! Perfect! 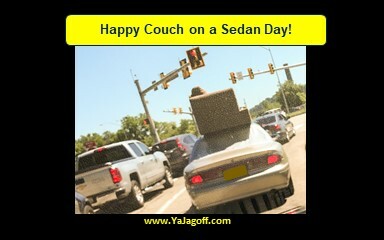 As we started across the bridge, I could see the couch rocking front to back as the driver and his sidekick sped up! This could possibly end very poorly so I held back.. .video phone in hand of course just in case!! Unfortunately the couch did not fly off at me. So I have no viral video to post today! I could have scored one of those storm chaser videos.. but only with a couch hurling at my head and windshield! Hey Couch-Maneuver-Mover…..everyone talks about Pittsburgh and the 6-degrees of separation of “I know a guy,” “Hey, wasn’t he married to….” stuff that goes on here. But, gotta tell ya, I think it’s 3 or even 2.898711 degrees of separation from ANYONE who has a pickup truck! Phone a friend for a pickup, next time, and just leave those sedan-bungee cords in your trunk for when you have your trunk full of bulk good from Sam’s Club this weekend… YaJagoff! Next article#YaJagoff Podcast / Oy Vey! Jagoffs and Oysters in Lawrenceville!